When used with SP Controls' Classroom Presentation Management System, offers a centrally managed, locally controlled system that enables you to monitor, control and provide security campus-wide using your existing networks and computers. Today's schools have limited budgets and staff to support technology, which makes our Classroom Presentation Management System a must-have infrastructure for any school. Imagine a single suite of products that runs presentations from a hand-held wireless device AND provides real-time annotation functionality, AND controls your audiovisual equipment through the iPad. 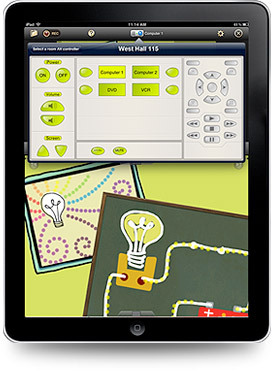 Doceri, in conjunction with SP Controls' Classroom Presentation Management System, offers features previously only available in high-end rooms.